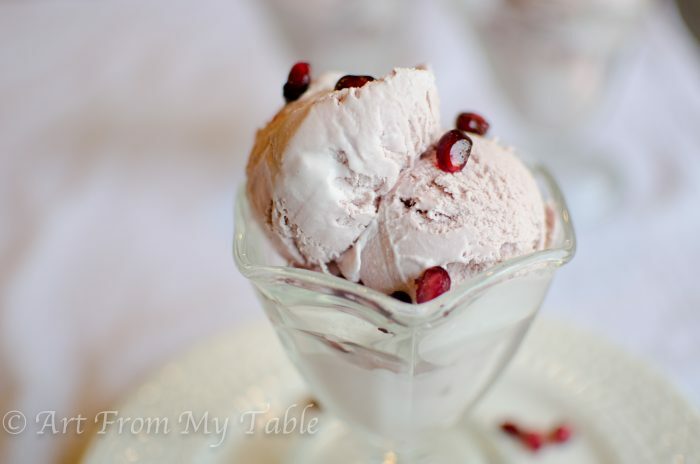 Pomegranate ice cream is the perfect blend of sweet and tart. 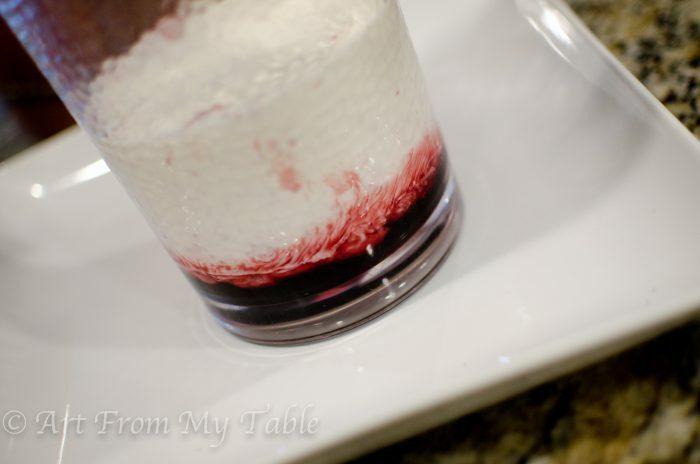 Refreshing on a hot summer day, and a delightful after dinner dessert or any time of the year. Ice cream, ice cream, we all scream for ice cream! 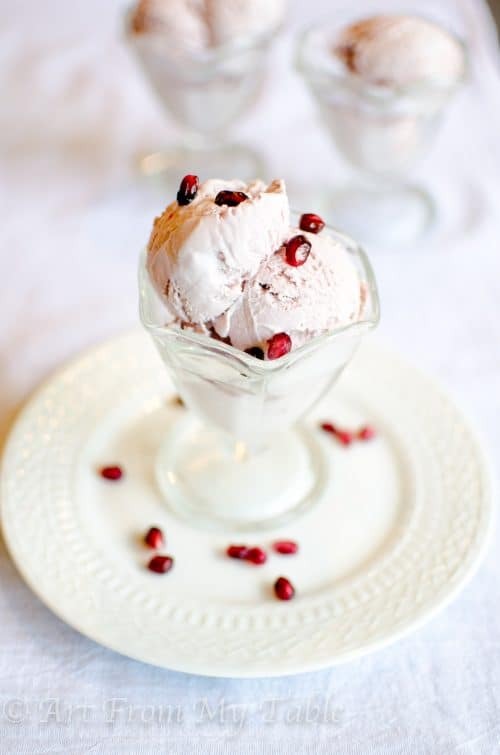 And you’ll definitely be screaming for Pomegranate Ice Cream!! Another one of my favorite things in the summer is ice cream. I really do like it year round, I mean, who doesn’t? But something about the hot summer sun makes me crave cold creaminess on my tongue and It. Is. Delightful. This summer we’ve started a new tradition, Ice Cream Sunday’s. Yes, we eat ice-cream every Sunday. I know, it’s a brilliant idea, right? Well, I can’t take credit for it. My dear friend Cindy Bultema from She Sparkles turned me on to it. I’ve been wanting to do this with my family for years, and this year, I finally implemented it. If you like inspiration and encouragement, please visit Cindy’s blog, you won’t be disappointed! Thanks Cindy for another awesome idea! 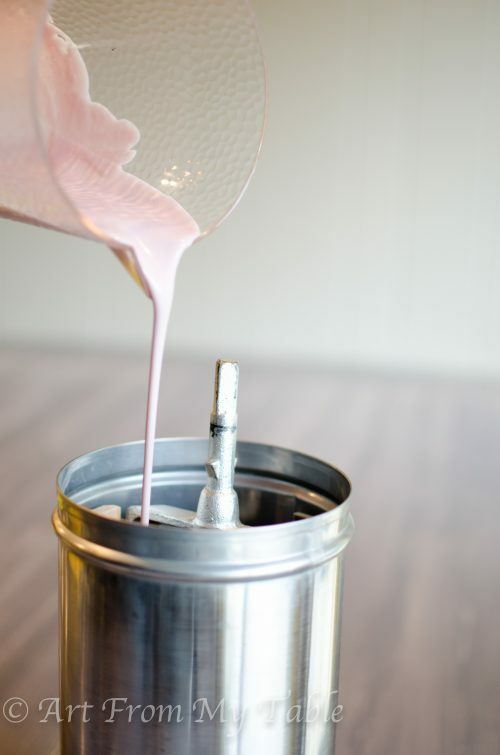 We have an ice cream maker, therefore we love to experiment with new flavors. I’ve been wanting to try pomegranate for while now. This pomegranate ice cream has bold flavor. It’s tart and sweet, and super creamy. 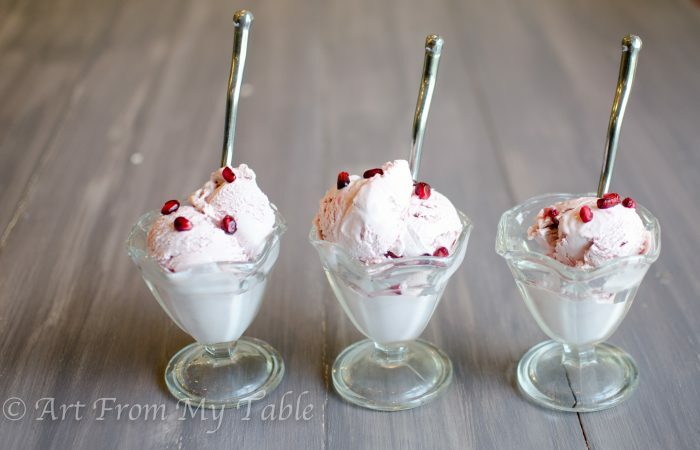 You’ll need an ice cream maker, ice, ice cream salt, pomegranate reduction (recipe follows), cream, and pomegranate arils for garnish (optional) If you want it rich, use all cream, if you want it a little lighter use a combination of cream and half & half, or cream and milk. I used all cream. 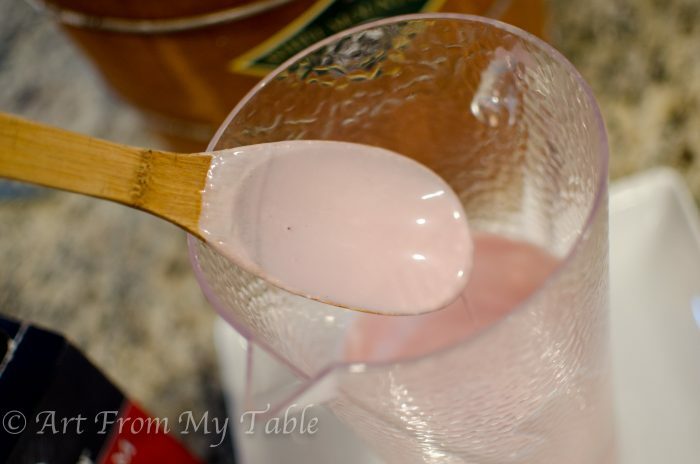 Mix your pomegranate reduction and cream together. I used a pitcher for easy pouring into my ice cream maker. 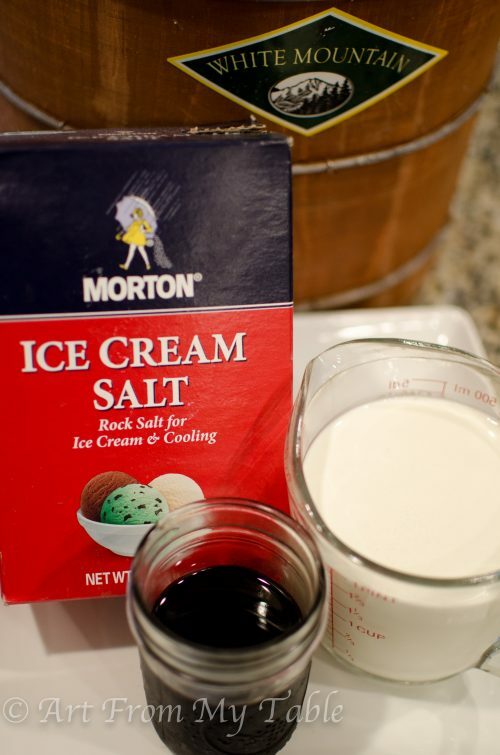 Now it’s time to put it in your ice cream maker and let it work it’s magic. That hardly felt like any work at all right? Super simple. Creamy deliciousness! Who wants to lick the spoon… or um, blade thingy? 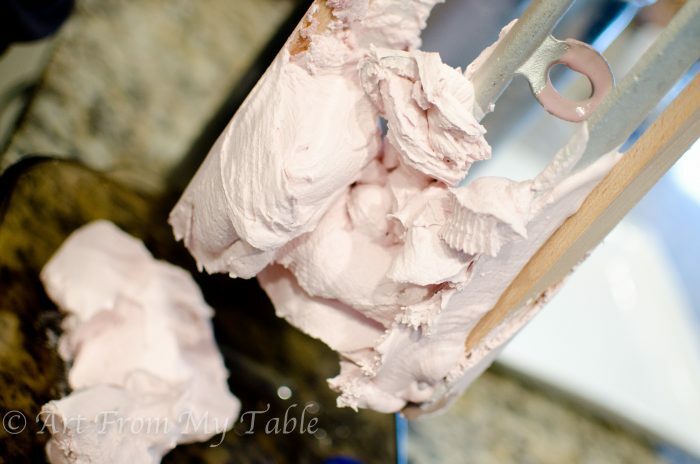 You can serve the pomegranate ice cream right away if you want to, right now it’s soft serve consistency. Or package it up and put it in your freezer until it hardens up and is more firm. The colder your ice cream is, the less flavor you can taste, so ideally, if it’s in your freezer already, let it sit out for 10-15 minutes for ultimate flavor. Another great thing about ice cream is it’s nutritional value. Dairy has so many good nutrients for your body. Milk does a body good! You can read more at www.milkmeansmore.org. 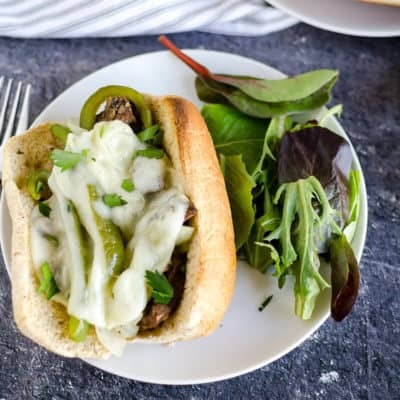 Plus, there are tons of recipes on their site. You won’t be disappointed! 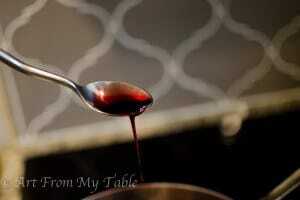 So here’s the scoop on the pomegranate reduction. (I just realized I said ‘scoop’, hardy had har!) When you do a reduction, you’re obviously reducing what you start with, in this case 100% pure pomegranate juice, but also, it creates an intense flavor. That’s why I chose to do a reduction for this recipe, as I mentioned before, it’s bold. Combine all ingredients in a medium saucepan. Bring it to a simmer, and let it go uncovered for about an hour until it’s reduced to 1 1/2 cups. It will be a syrup consistency. Want to take it up a notch? Infuse the cream with some cardamom pods. Just heat it gently over the stove. Remove the pods, and then cool the cream completely in the fridge before continuing with the recipe. 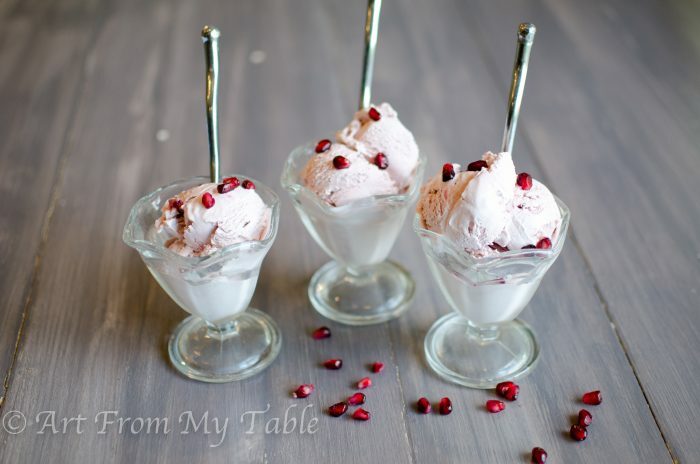 This makes a great fall/winter addition to the pomegranate ice cream. Bold flavor that's tart and sweet. Mix ingredients together, stir well. Follow ice cream maker manufacturers instructions. 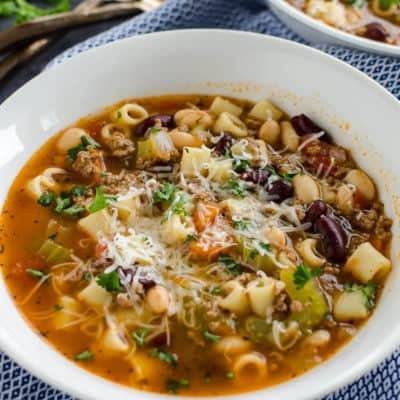 Disclosure: I’m honored to be partnering with United Dairy Industry of Michigan in order to bring you delicious dairy recipes that your whole family will love! Of course, all opinions are my own. 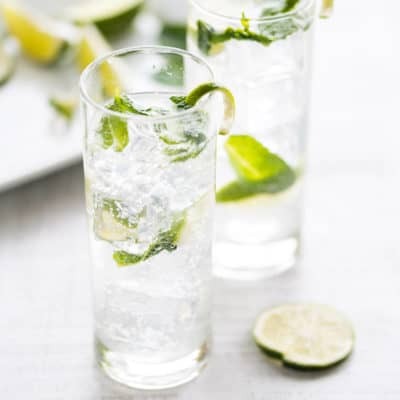 This looks so good, perfect for a summer day! Thanks for visiting Michele–here and in person!! I look forward to hearing what else your daughter is cooking up. 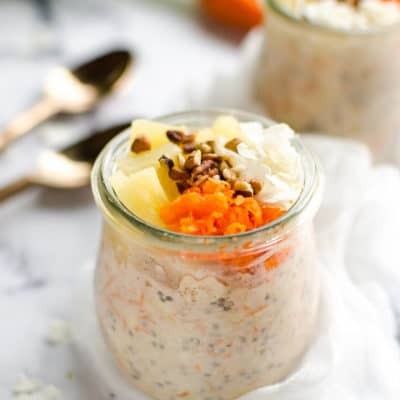 Hi Chellie, what a lovely dessert for the holidays…a nice change from all the pies and cookies that traditionally dominate the holiday dessert scene. And your photographs are really quite lovely. Well done. Lynn, thank you so much! I hadn’t thought of it that way, but you’re right! Typically you do see lots of cookies etc. Have a blessed holiday season! Carrie, you sweet words have encouraged me today! Thank you so much!! I look forward to a great bloggy friendship as well, too bad we can’t have that bowl ice cream together! 🙂 See you around the web!! Oh no…. me want it! Me want it! 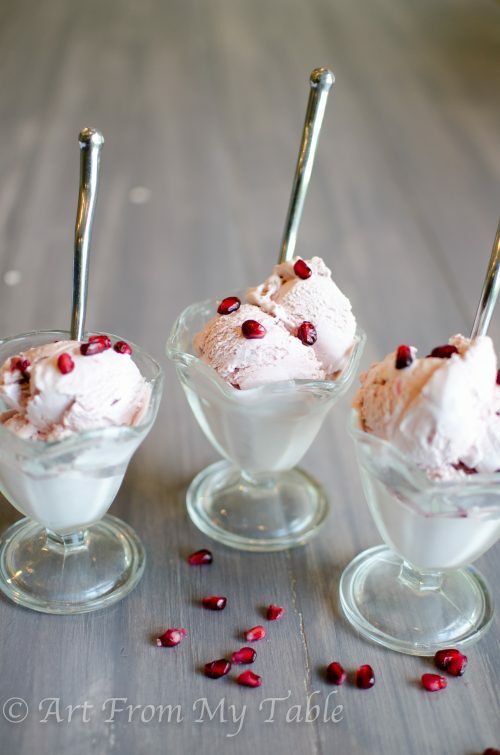 Pomegranate ice cream… hhmm… smells good! I Pinned it on Tasty Tuesday Creative K Kids Pinterest board. This looks so delicious! My daughter and I both love pomegranate, and ice cream. LOL In fact we have a pomegranate in the frig right now! Our ice cream maker died though so I’m going to have to hold off on this for a minuted, it looks so good!!! Pinning! I love pomegranate too! My mind is working over time on all the recipes I could use it in. But right now I’m making a whole mess of eggnog stuff. I love to eat seasonally! This “officially” made it to our holiday table menu – we can’t WAIT for Christmas! 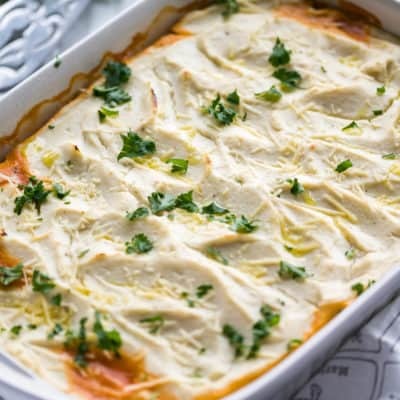 So excited to find this recipe! My boyfriend had a pomegranate ice cream once and has never been able to find it again. His daughter and I are making this for him for Father’s Day and he is so excited! That is so wonderful! I hope Father’s day was amazing for you all.